Interface with delabs, Give Feedback or Suggestions. 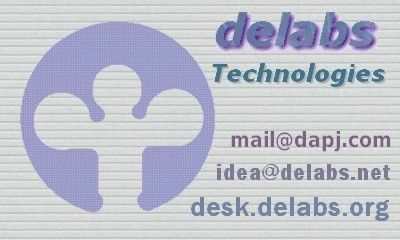 delabs focus is in Electronic Product Design and System Engineering. Fields are Industrial Automation, Test and Measurement and Custom product development. delabs gets letters asking questions, so i record in Circuits FAQ the questions and answers, If you want a project designed by delabs you can visit the Design Service page, which is a paid service. Schematics of delabs - Circuit Diagrams, Design. Soldermans Basics - Tutorials, Theory, Fundamentals. Hobby Hound - Hobby, DIY, Do it Yourself Projects. Circuit Design Gopher - Product Design, EDA, ASIC Design. Circuits FAQ - Electronics Design Notes and Answers. Power Electronics and Energy - Power Supplies, Electricals. Electronic Components - Parts, Instruments, Tools. Embedded System Design - Microcontroller, SOC, FPGA, ASIC. Industrial Electronics - Engineering Products Cladistics. RF Wireless and Photonics - Networking, Microwave, Optics. Semiconductor Devices - Diode, Transistor, IC Chips. Web Computing - Internet Devices and Cloud Networks. Electronic Materials - Electronic Components and Materials. Hobby DIY Electronics - Do it Yourself, The World Over. EE Design Group - Electronic Design Community. Innovative Elektrotech - Ideas of delabs, Applied Technologies. Anwheel Industrials - Process Control Systems. EEMetric Instruments - Test and Measurement.